If I were to tell you a simple trick that would jump-start your dream career, connect you with your heroes and save you time & money from failures… would you take the advice? This trick has been well known for thousands of years. Chances are the people you look up to have and still use it. So what is this trick they are doing? This is someone who has been where you currently are but has achieved the life you want to live. They have walked the path to success. Almost all are willing to show you how to do the same and, most importantly, the mistakes not to make! Like many of them, they have used mentors on their own journey and are honored to help with yours. An important point to make is that these mentors do not always have to help you through one-on-one sessions. I consider Tim Ferriss a mentor of mine but I have never met the guy. How? Because he has published over 100 articles, written 4 books, and interviewed extraordinary people on his podcast. This gives me a look into the mind of someone who I admire while providing me tons of value and advice to follow. How To Connect With A Mentor? There are a thousand ways to reach out and learn from these successful individuals but here are a few of my personal favorites. The easiest and quickest way, is to start reading books by these individuals. Pick up Foundr’s most recent project for advice from some of the top thought leaders and entrepreneurs in their industry. Search for these individual’s website as many have webinars, podcasts, or even free courses like we provide at Superhero Academy. Simply reach out to them via email. Hidden in the depths of Google you can most likely find anyone’s email address but be sure to put a lot of thought into your message. Sorry, “Will you teach me to be like you?” isn’t going to cut it kid. HIRE ONE… Want someone to truly keep you accountable and provide their time and energy to your project? It might be necessary to considering hiring a mentor. But hey, the best investment is an investment in yourself. There are different degrees of how involved a mentor might be in your journey. With a book you are deriving value alone and putting it into action for your individual journey. An exchange deal, like the one with Tim Ferriss above, gives you the opportunity to work side by side with your mentor to see how they operate their business. Occasionally slipping in the hint for advice every now and again! The third way is for the mentor (or coach in this instance) to put energy and focus into helping you create your own project. This is usually done by weekly calls and has a price. 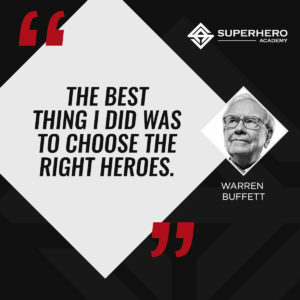 Recently, I took a risk by investing to go to Montreal and work with the founder of Superhero Academy and Valhalla Movement. Not many people were willing to invest in their education as I was and prove their work ethic. It paid off, now I am working with people I have looked up to for years (consider many good friends), have the ability to work from anywhere, and involved with projects I feel are truly making a positive impact on the world. First, pick up a copy of Foundr’s new book to get a great mix of advice from game-changers. Make a list of people you aspire to be like and are in the place you want to be. This can be financially, spiritually, physically, you name it. Send out emails to these people while remembering to be creative and show you can add value to their business or life as well. It can be in the form or free work or simply paying for hourly coaching calls. 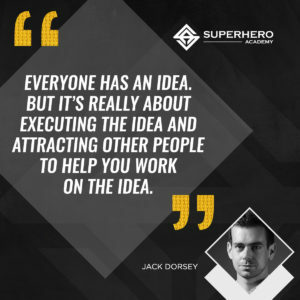 Start taking risks on your dream and keep up to date with Superhero Academy for more advice on how to better the world through entrepreneurship. Consider joining us in Costa Rica or Montreal for an intense month or week of work on your dreams.